This article describes the SerializableGraphSourceBase class defined in the Diagramming Extensions. The SerializableGraphSourceBase class is an abstract class which is designed to provide a base ViewModel implementation that supports item serialization. It derives from ObservableGraphSourceBase and it implements the ISerializableGraphSource interface. If you need to define a data-bound RadDiagram that has to support cut, copy and paste, you need to make sure that your custom GraphSource implementation derives from the SerializableGraphSourceBase class. The clipboard operations internally use the serialization strings of the diagramming items and therefore you need to create a GraphSource ViewModel that can serialize its business items. 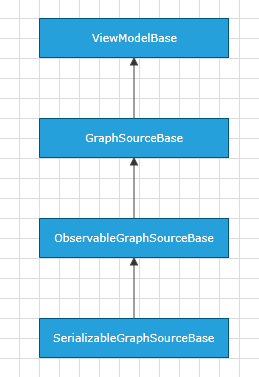 Also, please note that as SerializableGraphSourceBase derives from ObservableGraphSourceBase, it supports TwoWay binding to the RadDiagram GraphSource, as well as drag and drop operations. InternalItems Gets the internal ObservableCollection of business nodes. InternalLinks Gets the internal ObservableCollection of business links. Items Gets an IEnumerable collection of business nodes. Links Gets an IEnumerable collection of business links. GetNodeUniqueId(TNode) This is an abstract method that gets a node's unique id. This id should be always unique and should not rely on the object's reference. Please note that you have to override this method to define a custom unique ID for a specified node. DeserializeLink(IConnection, SerializationInfo) By default this method creates a new instance of the TLink type. However when overridden, this method should create a new instance of an TLink associated with the specified IConnection and restore any saved information from the specified SerializationInfo. DeserializeNode(IShape,SerializationInfo) By default this method creates a new instance of the TNode type. However when overridden, this method should create a new instance of an TLink associated with the specified IShape and restore any saved information from the specified SerializationInfo. SerializeNode(TNode, SerializationInfo) By default this method uses the GetNodeUniqueId() to serialize the unique ID of the node in the SerializationInfo. However when overridden, it should save important information about the node in the specified SerializationInfo. SerializeLink(TLink, SerializationInfo) By default this method uses the GetNodeUniqueId() to serialize the unique ID of the source and target nodes of the specified link in the SerializationInfo. However when overridden, it should also save important information about the link in the specified SerializationInfo. ClearCache Clears the deserialization cache that contains the items generated during the deserialization of the saved data. The cache should be cleared either before or after the deserialization of the GraphSource.